You know when something tastes like crap but you force yourself to drink it anyway because it’s healthy? That was my relationship with green tea until I met Pukka. I don’t know how they do it but they managed to get rid of that bitter herbal flavour that puts me (and a lot of you) off it. I’m thrilled they did because green tea is an anti-aging elixir. It keeps wrinkles off your face, gives your sunscreen a boost and even tones redness down a notch or two. What The Heck Is Green Tea? Green tea is derived from the evergreen shrub Camellia Sinesis plant (that’s how it disguised itself on the label, by the way). The same plant also gives us black tea and oolong tea, but through different processes. Green Tea is made by steaming and drying the leaves. Green Tea is rich in polyphenols, a group of antioxidants with anti-inflammatory properties. Polyphenols do double duty: they destroy free radicals and soothe the inflammation that causes them. The most powerful polyphenol in green tea is called Epigallocatechin-3-gallate (I know, it’s a mouthful!). It’s said to be 200 more effective than Vitamin E! Related: What Does Vitamin E Do For Your Skin? My fave green tea superpower? This little plant can reduce sun damage. 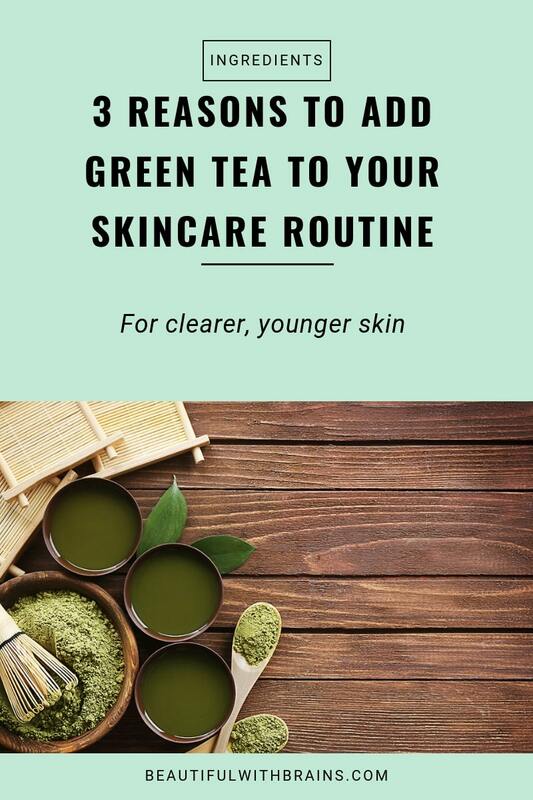 Studies show that “green tea polyphenols are photoprotective” and that applying them to your skin can help reduce inflammation and redness caused by sun exposure. In particular, polyophenols prevent UVB-induced oxidative stress (the kind that causes wrinkles and cancer) and the depletion of your skin’s natural antioxidant force. Epigallocatechin-3-gallate goes the extra mile: it also prevents collagen breakdown. Green tea is not a natural sunscreen, but it definitely helps give your sunscreen a boost. Turns out, green tea can help give acne the boot, too. A 2009 study shows that a 2% Green Tea Lotion is an effective treatment for mild to moderate acne. After using the lotion twice a day for 6 weeks, patients reported that “the mean total lesion count decreased from 24 before the treatment to 10 after 6 weeks after treatment, a reduction of 58.33%”. I wouldn’t use it as the only anti-acne treatment simply because it’s very rare to find this much green tea in any skincare product. But it should definitely be part of your anti-acne arsenal. Green tea is one of the most powerful antiaging weapons in your arsenal. It prevents wrinkles, fights sun damage and even boosts your acne. Drink your daily dose and give your skin its fix too. Do you use skincare products with Green Tea? Share your faves in the comments below. I love green tea! I am a regular drinker,especially after a meal with oily food. however, I don’t have any skincare with green tea, not sure if they really work on skin. Xin, I like to drink green tea. It tastes nice and it works for you. And it works even on skin, as long as the concentration is high enough. It’s an antioxidant, though, so you’ll see the effects in the long run as it prevents damage rather than reducing wrinkles. Vonnie, oh no! That’s a mistake I made too though. Sadly it’s hard for the consumers to determine how much of an ingredient is in a product and how it will work. But thanks to Dr Baumann we now know better. Great article Gio, Im glad you give us information about the effective concentrations of green tea cause its common to hear “this ingredient is good for the skin” but Im always wondering about the minimum amounts to have a benefical effect on the skin. Alejandra, thanks. I’m glad you found the article useful. Using if an ingredient is listed in third place it means there is quite a lot of it, but it may still not be enough to be effective. The smell may be well green tea though. I personally haven’t used much products with green tea, nor do I drink green tea much myself. I don’t really know why especially because I know about all the benefits of green tea especially when it comes to beauty. I gave a cream a chance once but didn’t see much effect from it so maybe that’s one reason! Chriselle, maybe the cream you use didn’t contain a high enough concentration of green tea to be effective? Also, because it is an antioxidant, you will see the effects in the long run and not straight away. You can always drink it though, it’s really lovely! I hardly use products with green tea ingredients. I don’t think that they can provide 100%. If my skin behaves bonkers I keep the tea bags (I luv drinking it!) to use them for a fast skin treatment mask. Mylanqolia, green tea products are effective, if they contain a high enough concentrations of it. But even though it’s an effective antioxidant, it’s not a miracle ingredient. That’s why I think it is a good idea to incorporate it in your skincare routine, but not rely solely on it and use products with other antioxidants, niacinamide and other beenficial ingredients. Roxana, I’m so glad to hear that. Thanks for your support, I really appreciate it. Just had a cup of green tea ? Does it help reduce belly fat? I like to drink green tea, and also use it as a toner and on my scalp. I put it in a spray bottle and spray it on my skin. Thanks for this lovely and informative post. Amanda, green tea is such a multitasker, isn’t it?